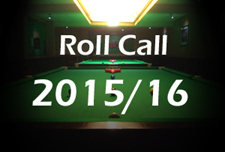 Day six at the Crucible at after all of the events and announcements yesterday from Barry Hearn (hence no diary), as well as victories for Barry Hawkins, Judd Trump, Marco Fu and Mark Allen as the first round approaches its end. 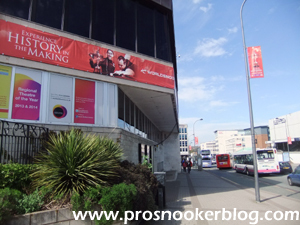 Wednesday began bright and early with the arrival of fellow blogger @snookerbacker to the venue for the first time this year, while on the baize the day began with the matches involving Judd Trump and Barry Hawkins, both runners up here in recent years. 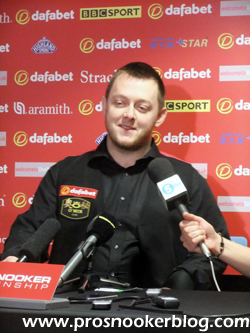 For Barry the morning would prove to be relatively straight-forward, victory on his birthday coming without the loss of a frame during the second session and he admitted afterwards in his press conference that despite last year’s run to the final, he still felt the ‘butterflies’ early in his match. Judd meanwhile found his match far tougher going, eventually being pegged back to 8-8 by qualifier Tom Ford, before eventually getting over the line. While he did not sound overly concerned by his performance, he will know that he will have to play much better if he is to progress against three-time quarter-finalist Ryan Day in his second match. With all due respect to Judd and Barry however, all attention yesterday was on what Barry Hearn would say during his press conference scheduled for 2pm and almost immediately after Trump left the press area, Hearn was in to give his address. As I said prior to the start of the tournament, I had misgivings as to whether the likes of Hendry and Davis should be given straight up wildcards, so I think that the compromise reached is a pretty smart one. Not only does it make sense commercially, to allow these players to be able to compete, but it is important that their places do not come at the expense of other players who have earned their tour places through more orthodox routes. 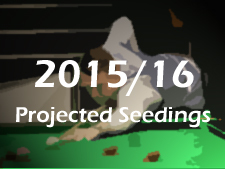 As for the format changes to the World Championship, clearly it is a relief to all within the game that the format of the tournament at the Crucible will seemingly remain unchanged, while it will add a new layer of importance to being ranked inside the top 16 after the China Open next season, to avoid having to win three matches in order to qualify. Anything that adds extra importance to a rankings race always works for me! 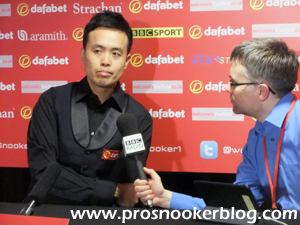 During the afternoon session, Marco Fu was in action against Martin Gould in what turned out to be one of the best matches of the first round, in terms of standard if not the scoreline. Having twice lost out to Martin before at the same stage of this tournament, Marco denied Gould a hat-trick of wins with an excellent performance, breaks of 124 and 116 the highlight. After the match Martin seemed to be happy enough with his own performance, crediting Marco for playing very well himself, while there was an amusing moment with Marco as he was asked for his opinion on the sacking of Manchester United manager David Moyes. Always keen not to offend anybody, or be drawn into anything that he shouldn’t, Marco was initially reluctant to comment, before eventually admitting that as a United fan, he was pleased by the news. On the other side of the curtain meanwhile, Neil Robertson was beginning his quest for a second world title against Robbie Williams and started strongly, adding another two century breaks to his season tally to leave himself needing five more to reach the 100 hundreds. From what I saw, Neil looked to be playing very well indeed and I do suspect that the extra week that he has had to recover from his run to the final of the China Open will have served him well here. 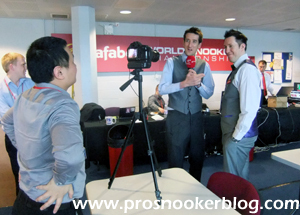 It was at around this time that one of the more surreal moments of the championship for me so far took place, as I was interviewed by Leo of the my147.com website in China. As well as the usual mix of ‘why did you start the blog’ style questions, I was also asked several questions about the David Moyes sacking and who should replace him. for a while I felt like I was a football pundit, all very unusual. Back on the baize meanwhile, Dominic Dale was making a strong start against Mark Davis, while Mark Allen made relatively short work of Michael Holt, who not for the first time here was clearly disappointed not to have brought the form that he so regularly shows at the qualifiers to the Crucible. For Allen, it was not a performance that will live too long in the memory, but he was clearly pleased to be through to the second round having lost in the first round here during the last couple of years. “There were times out there when I was playing that I couldn’t see the balls, I had blurred vision, dizziness. Just the last few days I have felt dreadful, an hour and a half before the match yesterday I was in the NHS walk-in centre, I just felt so drained, I spent all day Sunday just throwing up in the hotel room and for two days there I had no energy so I have been taking these sugar, salt drinks to get fluids back into my body and to be honest I couldn’t see anything over three feet away, it was just a guessed and I managed to guess right on a few times. Following the end of the session, it was time to head to the Graduate with a few fellow bloggers for a catch-up, while at the Crucible the table fitters set about work re-covering the tables, with the traditional late start on Thursday allowing extra time to do so. Arriving at the Crucible on the second ‘ladies day’ with the likes of Reanne Evans and Hannah Jones at the venue and immediately became embroiled in something of a ‘stat-off’ here in the media centre, with discussion of the second round match between veterans Ken Doherty and Alan McManus top of the agenda. Incredibly, the two will now have met at the Crucible three times in three separate decades, both at the last 16 stage and with each winning one contest 13-11 so far. “It doesn’t feel like that, just being here is brilliant, you soak up the atmosphere, I must have had some tough draws! Obviously when my name first came out against Mark Davis I thought that I’ve beaten him the last couple of times that I have played him, there is every chance this time, but it’s the Crucible, he’s a great player, I’m a great player, it’s just who deals with situations better on the day I suppose. Not known for his orthodox mannerisms, Dale threw in a few unusual references, referring to Davis leaving himself an ‘orchard’ and a ‘cherry tree’ at various points as he described the last few frames of the match, much to the amusement of tournament MC Rob Walker who could be heard laughing at the back of the room. “These I bought in the Royal Arcade in Cardiff. They were expensive, they don’t go down well with everybody. I think they were about £165, special deal from £80! 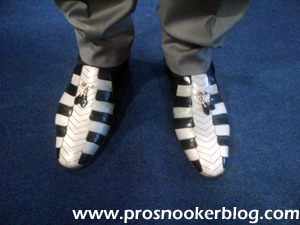 I’ve had them for quite a while, but they are not the sort of thing you wear in a nightclub are they! I don’t want to draw attention to myself when I am on the dancefloor because I can’t dance to save my life. Over on table two, Mark Selby and Ali Carter got the second round underway in what was a very entertaining session of snooker, Selby forging ahead at 5-1, before Carter responded well to take the last two and keep himself right in the match heading into tomorrow’s final sessions. “It was one of those matches that I was really determined to do well, to make amends for last year when I lost first round. It didn’t really matter, whoever came out of the hat was going to feel the wrath of some of my best snooker because this is the best World Championship that I have ever prepared for in terms of the practice and leading into it. “I was very determined to do well and yesterday you would always take a 7-2 lead, but I probably felt that it was more like an 8-1 session, probably 9-0, so I had to come out today and really destroy him tonight. I did that, he started off well with a 50 but he cleared up, then I made 140 and then a hundred again. It’s the sort of snooker that is required probably to win the World Championship this year and it is good to get it out of the system this early because I have got a really tough match with Mark Allen next. “This is definitely the best season that I have ever had, in terms of the way that I have played. I mean I have won two ranking titles but probably a fair reflection on how I’ve played, I probably should have at least four, with how well I’ve played. I’ve lost two finals, the China Open was one I could never really win because of my physical condition. “I felt with how well I’ve played this season I probably should have a couple more wins under my belt. But maybe it would be a bit disrespectful to all of the fantastic players out there to say that you are unhappy with winning two ranking event titles this season including the UK but with how I fell and how well I’ve played I feel that I should have won more but that’s why I am really determined to do well this week. “Everybody remembers the first sportsman to achieve a certain record. The fact that I am the first to make 70, 80, 90, is already kind of good enough really. It’s not as if somebody has already made 90 before and I would be the first to crack 100, I was the first to crack 70, 80 and 90, but it’s all happened this season. “It’s one I would love to do, absolutely no doubt about it. I’ve really concentrated hard this year on trying to clear the table, that’s something not about trying to make records but just trying to keep my opponent away as possible, trying to keep them thinking that I am in really good form, so the centuries have just kinda come with that. “It was funny yesterday with Stephen Hendry commentating, I think he really wants me to go for the record and he would probably love to see it made. I was on an easy black and I could have made the black missable by playing for a really hard red yesterday but I just cashed it in and straight away I just looked up and him and he was just laughing and he knew exactly what I was doing, it was really funny and then afterwards he spoke to me and couldn’t believe I did that. “We had a close one at the Masters when we both weren’t at our best this year but we’ve had a lot of really good matches, always go quite close as well. I have said many times before that he is one of the few players that I can sit down and watch play a whole session of snooker, I really like the way that he goes about it, the way he plays, very passionate about the way he plays, really quick and scores heavily and good to watch.And he says the odd thing that gets a few headlines in the papers which is good for you guys too! “He’s a brilliant player, a really good lad as well. It’s going to be a tough game, you look at a lot of the last 16 ties out there, Selby v Carter, Joe is playing Ronnie now, there are a lot of really, really tough games. “I’ve just got a few sinus problems with the weather but I am 100% fine now. Those two tournaments [Preston and Beijing] I should probably have pulled out of but I got to the final less than 50% in the China Open so that gave me a lot of confidence coming into this that with the fight and spirit that I showed out there. Healthwise I probably shouldn’t have played but I had enough time to recover for this tournament. There is something refreshing to me about hearing somebody talking in the terms that Neil has above, about wanting to destroy his opponent and so on. Some may dismiss it as arrogance, but to me that is the talk of a champion and is reminiscent of the sort of thing that Stephen Hendry would have said in his prime. So long as he can back it up with results on the baize, which he has done for a number of seasons now, there is nothing wrong to my mind with a bit of fighting talk. On the subject of champions, Ronnie O’Sullivan began his campaign over on table one during the evening session and interestingly looked well out of sorts, his long game in particular looking erratic, while Joe Perry took full advantage to open up a 4-1 lead. Back came Ronnie with two big breaks to close to 3-4, before Perry secured an overnight 5-3 lead heading into tomorrow’s second session. 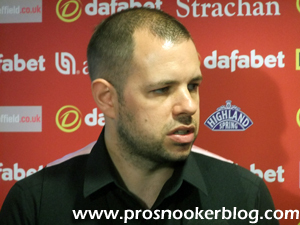 While there is undoubtedly a long way to go in that match, it certainly does the tournament no harm to see O’Sullivan put under a bit of pressure and it will be interesting to see how both players react to the scoreline tomorrow having had a night to sleep on it.